London has become one of the most advanced central hubs in Europe for advancing technology and innovation. The British government has taken a step forward to provide investments and fundings to the London tech city and its businesses. In addition, the government offers irresistible tax incentives to the tech-driven startups, and it provides them with top-notch opportunities to incubate and scale their ideas into a real product and service. The tech city of London is continuously evolving and experimenting with new ideas to turn them into reality. The United Kingdom features an abundance of tech talents, and nearly 2.1 million British residents are employed in digital tech companies. The incubators and accelerators based in London are backed up by venture funds, private investment firms, and venture capitalists. They are responsible for facilitating the rapid growth of startup businesses by offering education and training, mentorship, and excellent financing opportunities to accelerate the growth of the startup businesses. Because of the immediate access to capital and resources, London Tech City offers some of the best well-structured innovation actors such as SeedCamp, Startupbootcamp, Techstars and Founders Factory. SeedCamp is one of the top-notch and premium incubators in the world, responsible for offering micro-level funding to more than 650 entrepreneurs that span across 150 startups and 28 industries. In 2017, it provided more than $900m of startup funding! Startupbootcamp is becoming one of the top London-based incubators and accelerators, and it is responsible for accelerating 21 programs across the major tech hubs in the world. Its business focus is on areas like food, energy, commerce, transportation, and energy. It has invested in more than 540 startups with a funding of £250m since 2010. Techstars is an accelerator specialised in mobility, retail, and healthcare, and it has supported the starting up and funding of more than 1,024 companies so far. Techstar has played a crucial role in raising more than $3.8 billion of funds by itself – an impressive achievement considering the total $9.9 billion UK market capital. Companies like Sphero, Digital Ocean, and Contently were spinned off by TechStar. Founders Factory is another top tech actor based in London that is responsible for providing funding to early and late-stage startup entrepreneurs. Founders Factory is affiliated with a strong network of top-tier talents, which has resulted in providing their assistance to more than 200 innovative businesses that range over key technology sectors, including artificial intelligence, robotics, finance, and media. 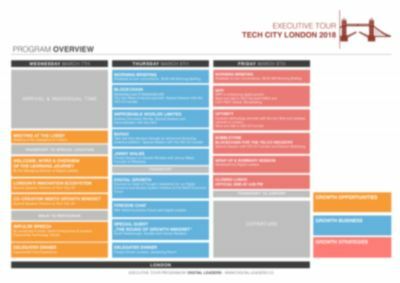 A London Tech City Tour for C-level managers most common format is 4-5 days (Sunday till Friday) filled with 40+ agenda points plus one additional workshop day for the group on Saturday.